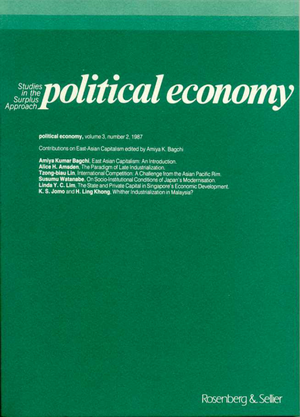 Amiya Kumar Bagchi, East Asian Capitalism: An Introduction. Alice H. Amsden, The Paradigm of Late Industrialization. Tzong-biau Lin, International Competition: A Challenge from the Asian Pacific Rim. Susumu Watanabe, On Socio-Institutional Conditions of Japan’s Modernization. Linda Y.C. Lim, The State and Private Capital in Singapore’s Economic Development. K.S. Jomo and H. Ling Khong, Whither Industrialization in Malaysia?